Amsterdam is known for its canals, alleys in the red light district and beautiful Amstel river, but also has a couple of great parks for you to relax and seek some peace and quiet in the bustling city. Amsterdam parks are open to the public and most have free art, theatre and other cultural activities. 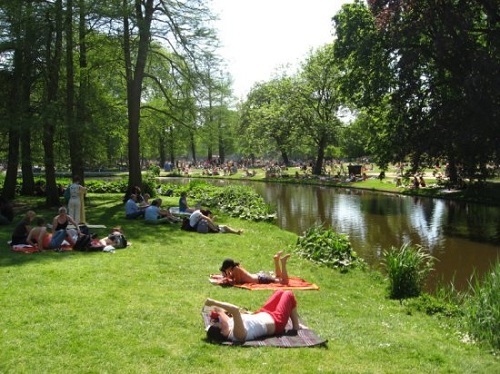 The best known and biggest park in Amsterdam is the Vondelpark. It is named after the famous 17th century writer and poet Joost van den Vondel. 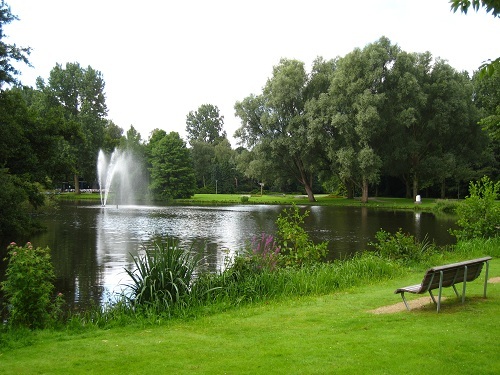 The Vondelpark has around 10 million visitors a year. 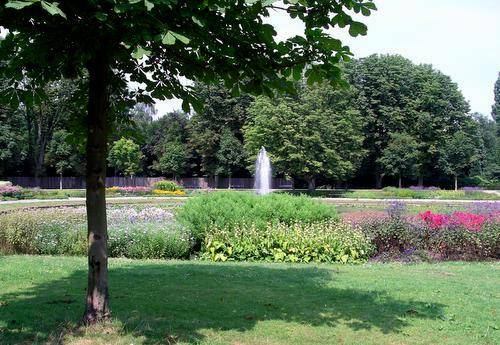 The Vondelpark boasts 120 acres of grasslands, trees and various big pools. There are also 5 restaurants obviously with terraces. Best known among the locals is the Blue Teahouse (Blauwe Theehuis) which has a second floor terrace so you can enjoy the lucsious green views from a higher level. 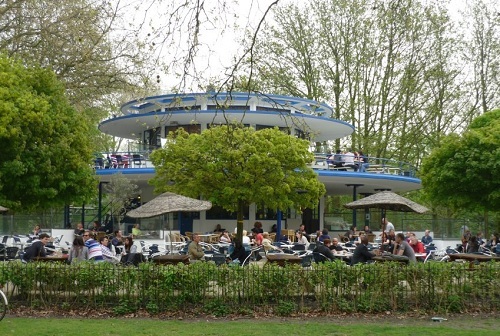 Also located in the Vondelpark is the open air theatre, where free concerts are given, especially in the summer. On Queensday and the 5th of May (freedom day) the park turns into a large flea market where children sell their old stuff and perform music and dance. 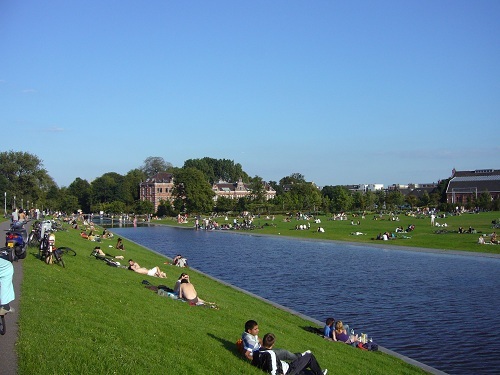 The Vondelpark is located near Leidseplein and next to Museumplein. 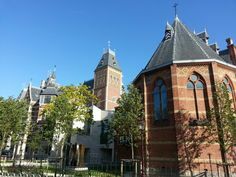 This makes the park ideal for a visit in combination with the Van Gogh Museum or as appetizer for a pub crawl in the Leidseplein area. Westerpark is perhaps the hippest of all Amsterdam parks in the last decade. This park is unique in architecture because its consists of the old park (since 1890) and a quite recent addition which is built on an old factory. The industrial buildings are preserved and now pack some of the trendiest bars in Amsterdam. There are also many small artistic companies located in these buildings. This gives the Westerpark a relaxed yet happening feel. During regular days you’ll see local people walk their dogs and childen play in the large open swimming pool. Yet in many weekends there are markets, festivals and concerts in the Westerpark. It’s large grass field with the dyke and the canal are perfect for big events. A great example of a typical trendy Westerpark even is the Rolling Kitchens (Rollende Keukens). This is a large food market with many many stalls that offer fresh foods ranging from homemade saucage sandwiches to Dutch poffertjes to organic fruit juices. 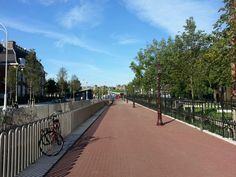 The Westerpark is located at the end of the Haarlemmerstraat , about 1.2 kilometers from Central Station. In Amsterdam’s affluent southside you will find the best maintained and probably the most chique of all Amsterdam parks, the Amstelpark. This park was built for the biggest gardening exposition ever held (the Amsterdam Floriade in 1972). For this reason is contains many features other than large green fields and trees. 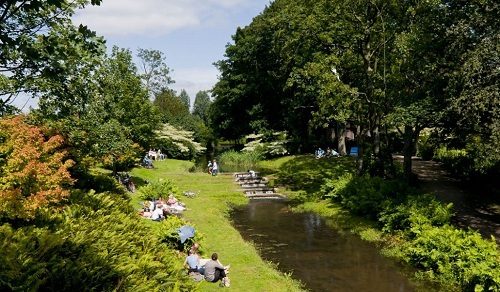 The Amstelpark is perfect for a visit with children. There is a large playground, a hedge labyrinth and even a train that will take you around the park. There are also many different animals in the park. Expect to see Galloway cows with large horns, squirrels (the only park in Amsterdam that has them), sheep, goats, a batcave and even kangaroos. The facilities for children and small zoo are not the only unique features of the park. From a gardening perspective this is by far the most interesting of Amsterdam parks. There is a rosary, a Japanese style garden, a flower valley and a Roman garden. The park is way less crowded than the Vondelpark. 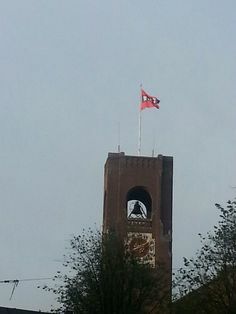 The Amstelpark is located right next to the river Amstel near the Riekermolen, probably Amsterdam’s pretties wind mill. 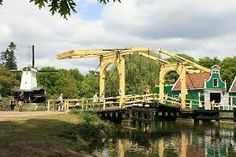 Take a day out to visit the park, the wind mill and a statue of Rembrandt all in one. 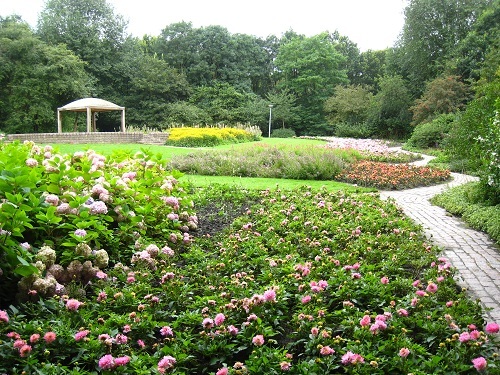 The Beatrixpark is another great park in Amsterdam’s south side. 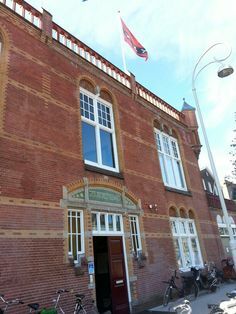 It is named after former Queen Beatrix. This park is one of the most quiet parks in Amsterdam. It has large green fields and a recently renovated pool with small wooden jetties. The largest green field is surrounded by pavillions which are a leftofer from a Floriade show in the 60’s. This park is perfect if you really want to chill out. The water streams are very relaxing and there are few people around. 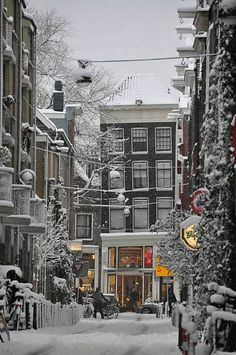 It is therefore one of the hidden gems in Amsterdam. 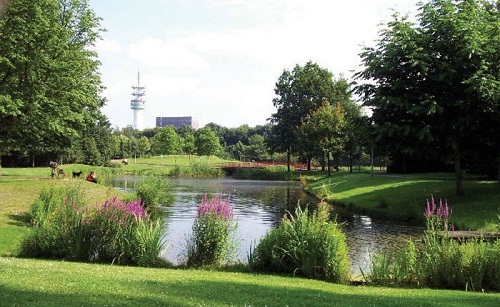 The Beatrixpark is located between the World Trade Center and the Rai congresscenter. You’re best to take tram 5 from Central Station to go there. Be sure to keep this information to yourself, we don’t want this park to become too crowded.